I've had many a Saint-Aubin in my day and I've rarely met one I didn't like. When at a restaurant in Burgundy, that's pretty much my choice as the aperitif bottle, unless of course I'm in Chablis when it would be a premier cru from that appellation. But near Beaune, I'm going Saint-Aubin, a real value wine that always seems to over-deliver at an affordable price. Saint-Aubin — a neighbor to both Puligny and Chassagne Montrachet — is in the southern part of the Côte de Beaune. Most of the vineyards lie on slopes that vary between 300 and 350 meters altitude. A 13th Century fortress stands in the center of the village. 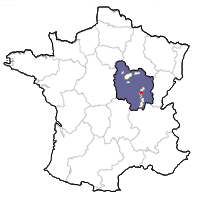 A nearby hamlet, also the name of a premier cru, is called Gamay — like the grape. Saint-Aubin is but one of seventy villages in France named with that name — taken from a 6th-century bishop from Anger. About 70% of the vineyards are planted with Chardonnay (just over 113 ha), the rest to Pinot Noir (just under 50 hectares). Thirty premier crus are spread around the appellation, with most of the whites planted on limestone and the reds on brown clays. White wines from Saint-Aubin have admirable richness without being overblown and also display good mineral cut. Aromas often evoke white flowers, pear, pineapple, green almond, orange, beeswax and honey. They're great on their own, or with medium-weight fish and chicken salads. Let's not forget about their red wines which, like those from Chassagne-Montrachet, can often be sleepers and impressive in their own right. They have blackcurrant, cherry and spice flavors, with silky textures and lively acids. These reds are always enjoyable with pork, chicken, or beef.